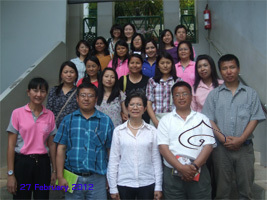 27 February 2012 : Child development workers from the Ministry of Education of Bhutan, led by Mr. Kinley Gyeltshen visited the Duang Prateep Foundation Montessori workshop at the DPF building, coordinated by UNESCO, Bangkok. Ms. Prateep Ungsongtham Hata , the general secretary of the DPF. welcomed distinguished guests and introduced them to Ms. Sasinan Nilchansiri , the Director of the Montessori education of the DPF. She guided the group to actual classes and concluded with a useful presentation. 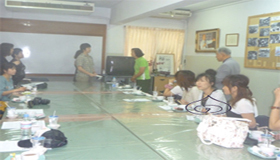 Child development workers from the Ministry of Education of Bhutan, led by Mr. Kinley Gyeltshen visited the Duang Prateep Foundation Montessori workshop at the DPF building, coordinated by UNESCO, Bangkok. Ms. Prateep Ungsongtham Hata , the general secretary of the DPF. welcomed distinguished guests and introduced them to Ms. Sasinan Nilchansiri , the Director of the Montessori education of the DPF. 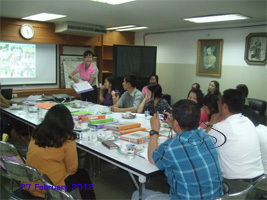 She guided the group to actual classes and concluded with a useful presentation.